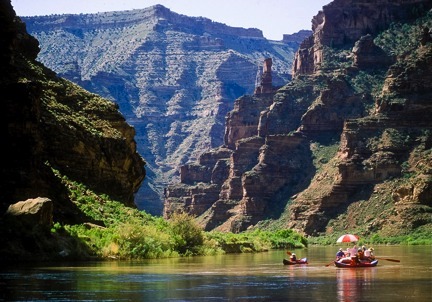 A popular Utah family river trip, the Desolation and Gray canyon river trip is 85 miles long and takes usually 4-6 days. Amazing Rock Art and Native American historical sites and ruins are found along the river or on hikes from the river. There are excellent hiking opportunities on many trails right from the river. 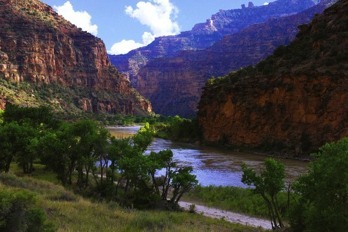 The scenery features red rock canyons, mountain vistas and big old cottonwood trees. Camping is usually on sandy beaches and there are lots of wildlife viewing opportunities. There are many flat water miles and lots of class 2-3 rapids. Outfitters often bring inflatable kayaks to add to the excitement. Permits are distributed via a lottery system. Applications may be submitted December 1 - January 31. Online application here.